Gionee M7 Plus is arguably the most impressive of the latest series of smartphones unveiled by its maker late November 2017. It is not only a behemoth in size, but also in terms of performance with a heavy-duty processor and abundant RAM. 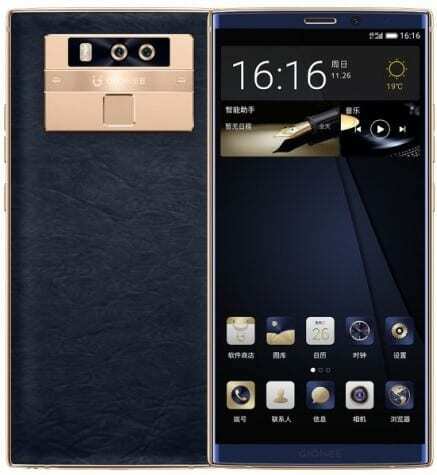 Although some might not think it, the Gionee M7 Plus is the real flagship of the latest phones announced by Chinese phone maker Gionee. You can also see this in the appearance of the device. There is glass on the front and the design also features aluminium frame and rear. It gets an even more premium touch with a leather cover, which Gionee says has passed through a 105-step process. The Gionee M7 Plus packs a colossal AMOLED display measuring 6.43 inches in diagonal size. This boasts Full HD+ resolution of 2,160 x 1,080 pixels and promises sharp images. With very slim bezels, it offers you an 18:9 aspect ratio that makes for more immersive viewing. The Gionee M7 Plus doesn’t boast the camera prowess of the Gionee S11 and S11s, at least when number is a factor. It gives you a combo of 16MP and 8MP sensors on the rear, similar to what the latter of those two devices offer. The Gionee M7 Plus boasts autofocus, LED flash and 1080p video recording capability. You get an 8MP camera on the front for selfie taking. Inbuilt storage is quite abundant at 128 GB. With that much storage, you don’t need a microSD card. But the Gionee M7 Plus still takes a microSD card with capacity of up to 256 GB for expansion. Under the hood, the Gionee M7 Plus carries an octa-core Qualcomm Snapdragon 660 chipset. This features four 2.2GHz Kryo and four 1.8GHz Kryo CPUs. The processor pairs with an Adreno 512 GPU and generous 6GB RAM that one can say bode well for performance and gaming. There is Android 7.1 Nougat operating system onboard with Gionee’s Amigo 5.0 UI. Another eye-grabbing feature of the Gionee M7 Plus is its high capacity 5,000 Li-Po battery. It supports fast charging, a good thing for a juicer this big. The fingerprint scanner can be found on the rear. Connectivity features include 4G LTE, USB OTG and Bluetooth 5.0. Gionee M7 Plus is not yet available in Nigeria and Kenya. Gionee M7 Plus Price in Nigeria is expected to range from 235,500 Naira to 300,000 Naira, depending on your location in the country. Price in Kenya is expected at around 77,999 KSh.